Let me start by saying I have a slight obsession with waffles, ok?! And, also let me say that I thought I had discovered the best way to make them…separating the eggs, whipping the egg whites for several minutes, gently folding them into the batter, etc, etc…it took a long time, but I thought they were totally worth it. Well, a good friend of mine introduced me to this new method of getting the crispiest, melt in your mouth, fluffiest waffles I’ve ever had. The secret??? Corn starch. Yep, by substituting corn starch for a portion of the flour, you get the lightest, crispiest waffle that is so light and fluffy on the inside. Perfect! 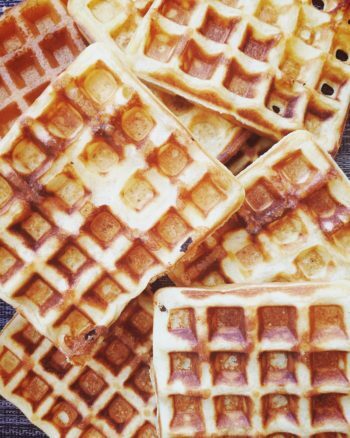 These waffles also freeze well and can be toasted when in a hurry. my favorite gluten free flour for these waffles can be found here. In a separate bowl, mix all the wet ingredients together. Incorporate the wet ingredients into the dry ingredients. Recipe adapted from Food Network…original can be found here.